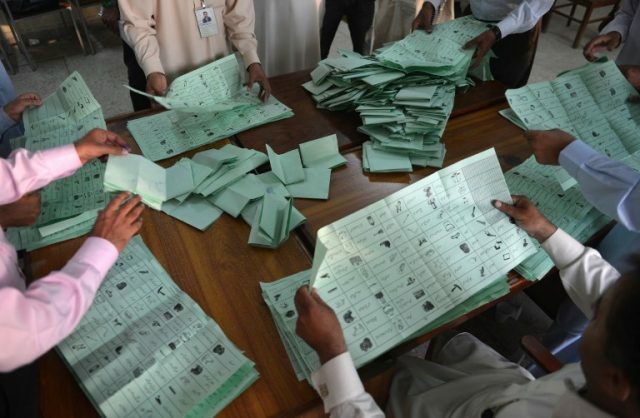 Police in Khyber Pakhtunkhwa’s Shangla district found a bag full of ballot papers in the car of a local PML-N leader and arrested three people, including a Pakistan Post Office worker. According to Alpuri police officer Sadiq Khan, they stopped local PML-N leader Afzal’s car and found marked ballot papers in a bag. The authorities believe they were going to be used for rigging. The police seized the bag of ballot papers and arrested Afzal and another man named Bakht Sher Khan. The two suspects then told the police about their third accomplice, Bashir Khan, a worker at the Pakistan Post Office. He was later arrested as well. Bashir allegedly gave the PML-N workers the ballot papers. The police registered an FIR against the suspects under sections 169 and 170 of the Election Act, 2017.